The National Baseball Hall of Fame Commemorative Coin Act suggests obverse designs that have convex and concave shapes similar to the 2009 International Year of Astronomy commemorative coins by the Monnaie de Paris (French Mint). The Mint images above show the gold coin and its shape. Newly introduced legislation in the U.S. House of Representatives calls for uniquely designed commemorative coins to recognize and celebrate the National Baseball Hall of Fame. Named the National Baseball Hall of Fame Commemorative Coin Act and numbered H.R. 2527, the legislation would authorize the United States Mint in calendar year 2015 to produce $5 gold coins, silver dollars and clad half-dollars in collector proof and uncirculated qualities. H.R. 2527 was introduced by Rep. Richard L. Hanna, R-N.Y., on July 14. It already has 296 cosponsors, suggesting an improved likelihood that it will eventually make its way through the House of Representatives and move to the Senate. Like any legislation, there is no guarantee it will pass in both chambers and get signed into law by the President. In fact, a nearly identical bill, numbered H.R. 6534, was introduced in the previous session of Congress and it sported a solid list of 191 cosponsors. It died due to inaction, although its standing was hampered by an extremely late December 2010 introduction and a lame duck session of Congress. One factor that could hurt H.R. 2527’s chance of passage is the year the coins would be minted. Modern commemorative coins are often issued during a significant anniversary of an event or person. The Act designates that the coins would be issued "during the 1-year period beginning on January 1, 2015." 2015 is not a milestone anniversary year for baseball or for the National Baseball Hall of Fame, which opened on June 12, 1939. The 75th anniversary of the Hall of Fame is in year 2014. Design themes which are required to be "emblematic of the game of baseball and of its place in American sports and the American way of life." Typical inscriptions of the coins’ value, year (2015), and the words Liberty, In God We Trust, United States of America, and E Pluribus Unum. Reverse (tails side) designs featuring a baseball "similar to those used by Major League Baseball." A requirement that the Secretary of the Treasury must hold an obverse design competition, with the winner receiving at least $5,000. The judging panel would consist of the Secretary, three members of the Citizens Coinage Advisory Committee (CCAC) and three members of the Commission of Fine Arts (CFA). An expectation for the commemorative coins to feature reverses that are convex in order to resemble a baseball and obverses that are concave to provide a "more dramatic display." H.R. 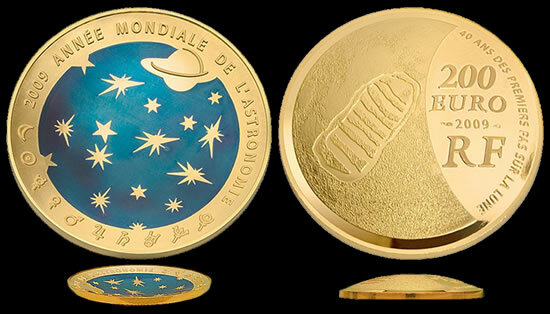 2527 specifically cites the 2009 International Year of Astronomy commemorative coins as an example. These coins were issued by the Monnaie de Paris (the French Mint) and have convex / concave features. The Hall of Fame $5 gold coins would weigh 8.359 grams, have a diameter of 0.850 inches and feature a composition of 90 percent gold. The Hall of Fame silver coins would weigh 26.73 grams, have a diameter of 1.500 inches and contain 90 percent silver and 10 percent copper. The Hall of Fame clad half-dollars would weigh 11.34 grams, have a diameter of 1.205 inches and include the same composition of metals that are found in the circulating America the Beautiful quarters and Roosevelt dimes. All commemorative coins sold by the United States Mint include surcharges that are paid to qualifying institutions which are specified in the enabling legislation. H.R. 2527, if it became law, would mandate surcharges of $35 per $5 gold coin, $10 for each silver dollar and $5 per clad half dollar. Those surcharges would help finance the National Baseball Hall of Fame, located in Cooperstown, N.Y., which is also within Rep. Hanna’s district. "The National Baseball Hall of Fame Commemorative Coin Act unites every fan of the game in celebrating the timelessness of America’s pastime," Jeff Idelson, President, National Baseball Hall of Fame and Museum, said in a statement. "As the National Baseball Hall of Fame and Museum celebrates its 75th anniversary in 2014, the Coin Act will connect every generation in commemorating the impact Cooperstown has had on the national landscape, honoring our baseball heroes while educating future generations on the historical significance of the game and its lore." H.R. 2527 has the potential to raise a total of $9.5 million in surcharges if the maximum amount of coins were sold. The Congressional Budget Office (CBO) estimates that the final amount would come to a figure of around $8 million based on sales of similar commemorative coins. The National Baseball Hall of Fame and Museum is an independent not-for-profit educational institution. The National Baseball Hall of Fame Commemorative Coin Act has been sent to the Committee on Financial Services and the Committee on the Budget. I hope this example is not the same design as the Silver Dollars will be. If so, I will not be buying any of them. Please make the baseball comm. a very special design, that everyone will say WOW too. I Love Baseball. I say make (1) for each ERA. Just my opinion….. Get This One Right Please……..